Eastern Wyoming College Student Senate recently joined with Banner Health and held a fundraiser event called “Kiss the Pig”. EWC Student Senate had four participants and Banner Health had 4 participants. Donations were taken on behalf of the participants. EWC participants were Zach Smith, Dr. Lesley Travers, Amanda Asmus and Cameron Heath. Banner Health participants were Matt Mattis, Kyle Telford, Sandy Dugger, and Zach Miller. The participant that raised the most money got to Kiss the Pig at half time during the Lancers basketball game on February 3. The winner from EWC was Cameron Heath and Matt Mattis was the winner from Banner Health. The total raised was over $400 for the American Heart Association. The baby pig was provided by Hunter Hill, EWC Student Senate President. 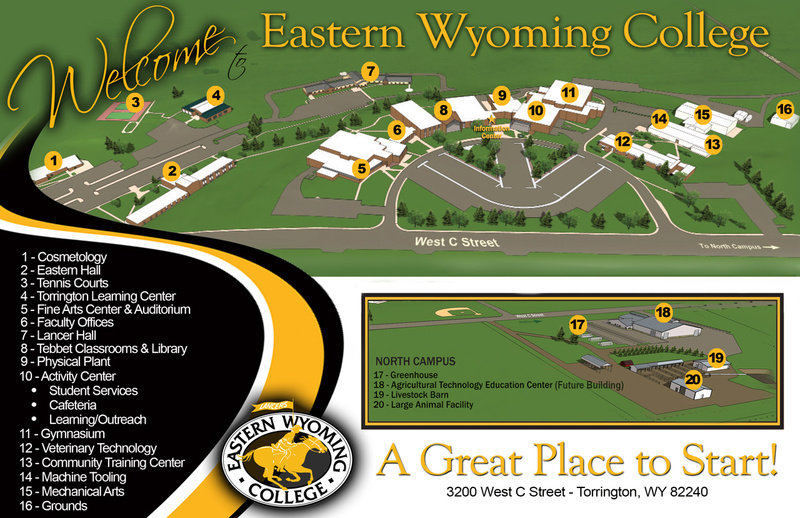 The Community Education office at Eastern Wyoming College in Torrington is offering the following a presentation by the Peak Wellness Center titled “Divorce and Starting Over”. This workshop will be held on Saturday, March 24 from 9:00 am – 3:30 pm in the EWC CTEC building room 133. The cost of the workshop is $125. This workshop is for persons who are divorced or thinking of divorce. Whether you are recently divorced or have been divorced for years, this is an event you want to consider. The focus of this workshop will be to educate and inform in a supportive and informal setting. This is not a lecture program, it will be participative. Individuals will be encouraged to discuss and explore materials and meet others with similar experiences. Topics to be explored: the 10 leading causes of divorce; what to consider before either you remarry or enter another relationship; communication—how good is your communication, what are potential roadblocks to good communication; the impact of divorce on children and family members; how to avoid bringing the GHOSTS from the past into a current relationship. This workshop is not a formal event—the structure and format is to allow for a comfortable and interactive environment. Come planning to share, as you chose, and learn by interacting. Plan to relax and have fun as we explore together. The purpose is help individuals evaluate what they might do differently in future relationships, learn from their past, and hopefully, acquire new skills. Terry Stanclift, LPC, will facilitate this workshop and is a licensed professional counselor with many years of experience in the mental health field. He has experience working with adults and a wide range of presenting problems. He has also been divorced and studied this issue for many years. EWC Community Education will be taking registrations and payment for this workshop. Cole Porter’s Tony Award winning romantic musical comedy follows the backstage antics of a touring company performing The Taming of The Shrew. The characters include two feuding couples, a few gun-toting gangsters and some of the best songs written including “Another Openin’, Another Show”, “Too Darn Hot”, “Wunderbar”, “So in Love”, and “Brush Up Your Shakespeare”. This hysterical play-within-a-play where each cast member’s on-stage life is complicated by what is happening off stage is sure to keep you laughing all afternoon long. The cost of this trip is $70, and the paid registration deadline is March 1. Eastern Wyoming College Secondary Agriculture Education student, Angelina Bannon, sophomore, Lusk, WY, collected non-perishable food and goods recently at a men’s and women’s basketball game. Angelina chose this as her service project for her American and Wyoming Government class. Her goal was to re-stock the closet for EWC students that are in need of non-perishable food and goods during the semester. She collected a number of canned items, peanut butter, chili, mac and cheese and personal hygiene items. Have you ever wondered how the great European painters of the past created their astonishing illusions of light and shadow using oil paint? They didn’t have any secrets, it was all about technique. It is a bit of science mixed with a lot of artistry. This class will be held on Tuesdays, March 13 through April 3, from 5-8:00pm. The cost of this class is $45. Come and learn this fascinating technique with EWC Art Faculty John Cline. Prior experience working with oil paints is helpful, but not essential. Throughout the course, you will learn the technique by recreating a still life painting by the 17th Century Dutch painter Adriaen Coorte. You will need to purchase 6 tubes of paint (oil medium), brushes, a mixing knife and canvas. Kits will be available for purchase at the EWC bookstore.